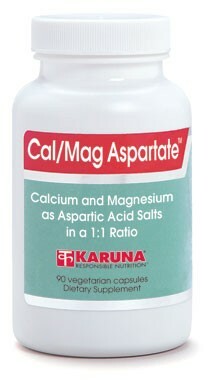 2114_CalMagAsp_1-1 By practitioner request, Karuna provides this popular product in two Ca:Mg ratios - both 2:1 and 1:1. Both calcium and magnesium are required in significant amounts by humans and many diets are poor in these minerals. Calcium and magnesium play complementary roles together to support skeletal health, neuromuscular activity, optimal vascular tone, and normal menstrual cycle physiology. Aspartic acid, an amino acid, is a particularly efficient mineral transport agent, originally investigated by German researcher Hans Nieper, and additionally supports cellular energy production. Optimal calcium and magnesium intake is associated with normal vascular tone and healthy blood pressure regulation (Ann Intern Med 1983;98:800-5). Experimental studies and case reports suggest that magnesium has a special role in opposing neuromuscular hyperexcitability (Med Sci Monit 2002;8:CR326-30; Eur J Neurol 2000;7:741-4; S Afr Med J 1985;68:332-3; Phys. Sportsmed 1983;11:79-81). Calcium and magnesium both support premenstrual physiology (Psychoneuroendocrinology 2003; 28:39-53) and normal uterine muscle tone during menses (Am J Obstet Gynecol 1998;179:444-52; Ther Umsch 1996;53:431-41; Am J Obstet Gynecol 1993;168:1417-23). Suggested use for adults: 3-6 capsules daily taken with meals,or as directed.